Place all ingredients into gallon-sized freezer bags. Set out from the freezer into the refrigerator the day before you need it. 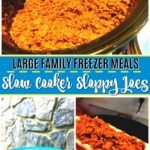 To cook, put Sloppy Joes in slow cooker and cook on LOW for 4 hours.